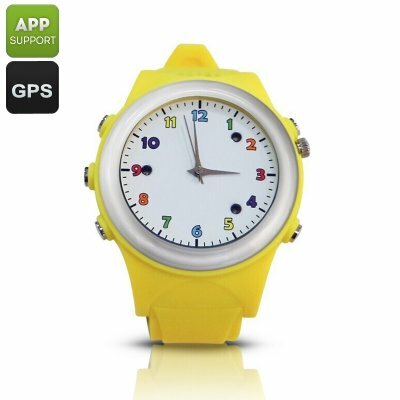 Successfully Added Child GPS Phonewatch - Wireless Charging, Digital Fence, Familiar Number, SOS, Traditional Quartz Design (Yellow) to your Shopping Cart. This GPS phone watch features a traditional Quartz design and is the perfect gift for your little son or daughter. Not only is it a cute accessory and fun toy for your child, it also comes with lots of practical features that guarantees your child’s safety while playing outside on his own and gives you, as a caring parent, some peace of mind. Using both GPS and LBS to secure precise positioning this smart watch ensures that you always have the latest data on your child’s whereabouts. It furthermore allows you to set up a digital fence through which digital borders based upon location can be set that your child should not cross. If your child crosses into this forbidden territory the smart watch will immediately sent a notification to your smartphone, informing you about your child’s current location. Featuring both a microphone and speaker this smart watch allows your child to call to three preset white list phone numbers. At the same time, you can always reach your child by calling him as this phone watch holds its own unique SIM card. Additionally, you have the possibility to establish a list of friendly phone numbers that are allowed to call your child’s smart watch via the white list setup. This provides you with extra peace of mind as you can be assured that your child will never receive a call from an unfamiliar phone number. Its built-in speaker and mic furthermore allows you to listen in on your child without disturbing them if you suspect anything serious has happened. Coming with a 300mAh battery this smart watch can be held for 72 hours on standby mode. It comes with a special Qi wireless charging stand in the form of a chess piece through which you can easily and wirelessly charge the device. This makes charging more fun for your child and additionally takes away the danger of potential electric shocks. This child GPS watch comes with a 12 months warranty, brought to you by the leader in electronic devices as well as wholesale electronic gadgets..